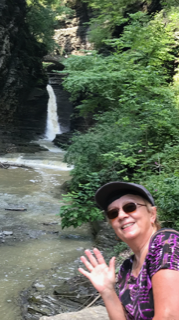 In late July, my hubby and I left our Virginia home and traveled to the Finger Lakes area in New York. Why? 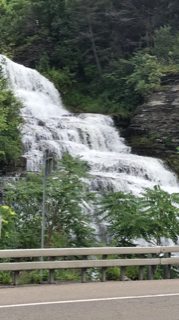 To see the waterfalls! Here is why we were interested in this location: In the evenings we occasionally watch the “Aurora Teagarden Mysteries” on the Hallmark channel. 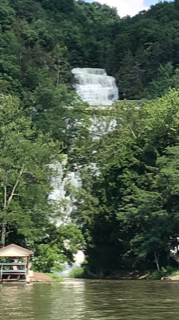 The setting is in Montour Falls, New York, a small village that has the She Qua Ga Falls (meaning ‘tumbling waters’) situated off Main Street for all to see. 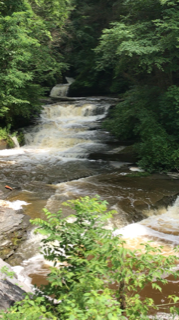 As I watched these mysteries, I’d see the falls scene; my heart would leap every time! 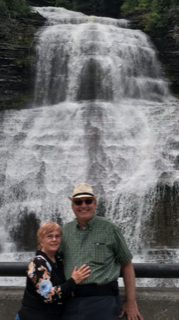 I’d declare, “Someday I’d like to go there and enjoy the falls.” And so that’s what we did! As we got closer to the vacation date, the forecast was for rain our entire vacation week, and we’d already experienced a week of rain at home. Oh well! We were determined to enjoy our trip. We packed boots, rainwear and umbrellas. 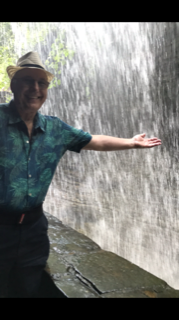 We would trudge through rain every day, if necessary, and enjoy all the waterfalls there are in the area. We would not let weather deter our adventure! We packed for all types of weather, and hit the road. We made our usual restroom stops every hour or so (potty breaks, and to keep our limbs from getting too stiff) and found a delightful restaurant for lunch, the Shamrock in Thurmont, MD. Their corn beef sandwich was yummy! We had traveled nearly nine hours by the time we arrived at our destination, The Burdett House B &amp; B. We were so very exhausted, and I can’t tell you how thankful we were to find that our bedroom was on the first level! We quickly unpacked and collapsed into bed. The hosts, Ashley and Dave, gave us a delicious breakfast with much-needed coffee. 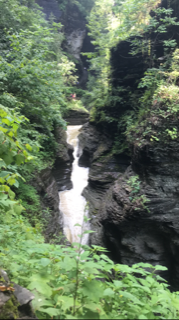 They suggested we go to Watkins Glen State Park, where we could hike to see MANY waterfalls. Only scattered rain was predicted, so we went prepared. Ashley had suggested we take a shuttle to the top and only hike one-way. Sounded great to us! OH MY! The falls were awesome! 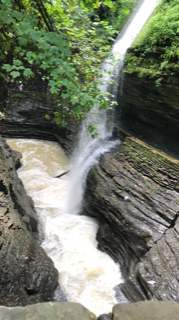 It was like viewing a mini Grand Canyon! 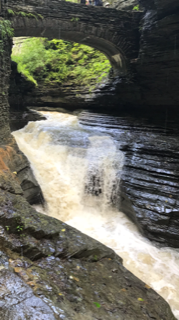 All of the falls were very full because of recent rains. 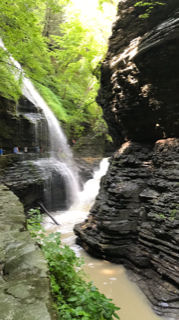 We marveled at how water cuts into solid rock over the years, to make deep gorges. We had to admire how awesome and mighty our Creator is! was able to enjoy the scene before me. Isn’t that how life is? If our focus is on one small thing, we can miss out on something huge, something fantastic. The She Qua Ga Falls were indeed awesome. We were mesmerized for some time. 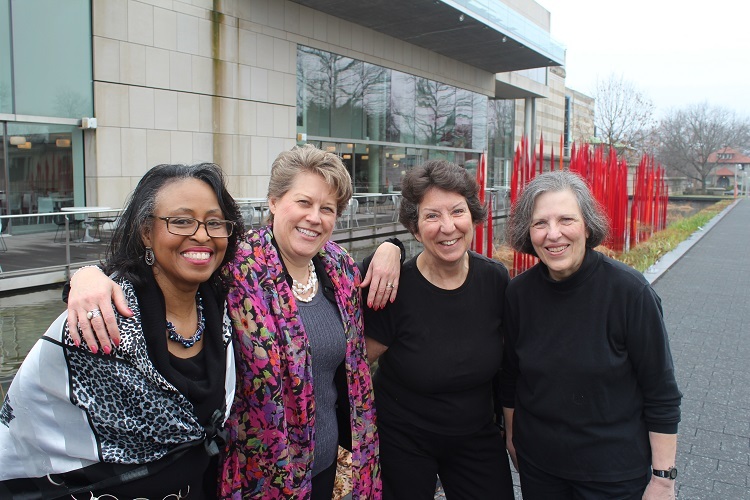 Our hearts filled with gratitude at so many levels! The area is also known for vineyards, but my hubby and I never developed a taste for wine. 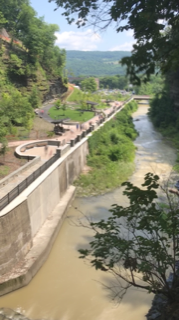 We did go for a ride on Seneca Lake (yes, dizzy again) and saw two salt mines, as well as the full length of Hector Falls. 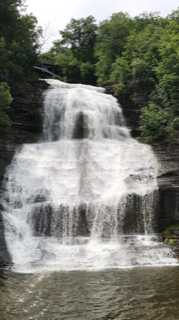 Later, while in our car and up close, we saw the top portion of Hector Falls beside the road. If we’d been traveling fast, we would’ve missed it. Another life lesson? We spent the last day of our vacation at the Ithica Farmer’s Market. We found beautiful, delicious fruit and vegetables, and many unique artistic items to admire. Our bodies SCREAMED with each step! But we insisted on bodily cooperation as we proceeded. The ride home is always longer, isn’t it? At each stop we had to literally throw our bodies out of the car! Once home, exhausted but satisfied, we agreed this vacation was a 5- star success. Maybe on our next adventure, we’ll travel less miles – or fly! 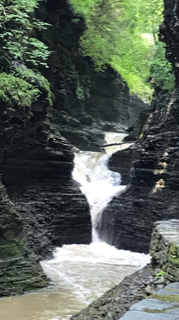 Please Google my podcast, “Turn to God with Carin” to listen/ view the segment dated August 13th entitled, “Waterfalls.” I hope you enjoy our pictures!